The non-profit Seafood Nutrition Partnership (SNP) is planning for a fall celebration of seafood, leading up to festivities commemorating National Seafood Month in October. This two-month #SeafoodParty invites everyone to try some amazing seafood recipes while learning how eating seafood twice a week is essential for a healthy heart. 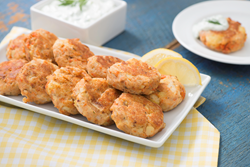 Salmon Cakes with Yogurt & Cucumber Sauce make for a tasty appetizer at any #SeafoodParty. The non-profit Seafood Nutrition Partnership (SNP) is planning for a fall celebration of seafood, leading up to festivities commemorating National Seafood Month in October. This two-month #SeafoodParty invites everyone to try some amazing seafood recipes while learning how eating seafood twice a week is essential for a healthy heart. Get creative with celebrating, just start with seafood. September is Family Meals Month, so one party idea is to invite loved ones over for a family-style seafood meal and catch up on each other's lives. Or, as football and basketball seasons begin, get everyone together to watch the game and munch on some healthy, delicious seafood snacks. "Whatever type of party you decide to have, you'll showcase your passion for seafood and heart health, and Seafood Nutrition Partnership will help you make it a success," said SNP President Linda Cornish. By pledging to eat at least two servings of seafood each week and supplement with omega-3s as recommended by the Dietary Guidelines for Americans, you will benefit from improving your overall health and reduce risks of heart disease. Seafood, fish and shellfish, is a lean protein that tastes delicious, can be incorporated into nearly any dish and provides support for heart and brain health. SNP is teaming with House Party to find 250 party hosts and equip them with product samples, coupons, recipes, and tip sheets. If you’re interested in hosting a party, learn more online. The coming months will include a number of additional #SeafoodParty events, contests, and resources, including fun appetizer recipe ideas just in time for tailgating season and the fall holidays. Follow SNP and the hashtag on Facebook, Instagram, Twitter and Pinterest. House Party, Inc. is the leading influencer marketing platform that drives authentic advocacy at scale by connecting brands with their biggest fans. Our proprietary platform enables brands to identify influential advocates, engage them with in-person experiences, amplify their advocacy through social media and offline word of mouth and measure the impact on brand metrics and sales. By leveraging our proprietary technology and socially-savvy community of over 1.1 million consumer influencers, brands have a one-stop shop for sampling, social sharing, branded consumer content creation and more. For more information, visit about.houseparty.com.